and civilian needs in the Columbus area. Give us a call TODAY … (800) 345-5058. We look forward to hearing from you. Our OA Coordinator, Vicky Bankston, is ready to assist you. 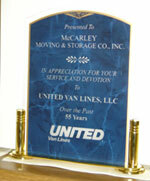 Vicky has over 35 years experience in the moving industry. Contact Vicky today for all of your OA needs. She can be reached at (800) 345-5058 or by email.